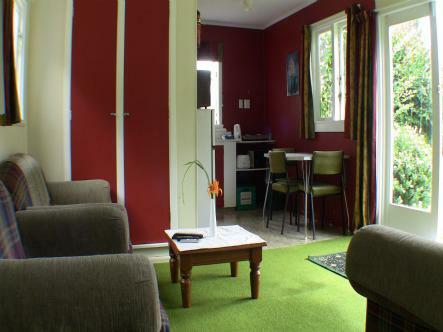 Our cute and retro Cottage has that true 'kiwi bach' feel. It's perfect for larger groups and families or couples wanting all their facilities under one roof. The unit has fully-equipped kitchen facilities, flat-screen TV with free-view in the lounge area, shower/bath and toilet, and good heating for winter. There is, unfortunately, only 1 Kiwi Cottage. 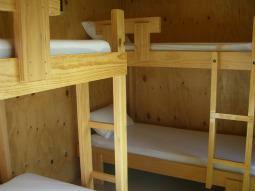 Our five person standard cabins available are suitable for up to five guests. The beds - one double with a bunk overhead, and an additional set of bunks - come with bottom sheets, pillows/pillowslips only. Bedding hire available. Complimentary tea and coffee supplies and cutlery and crockery are provided. 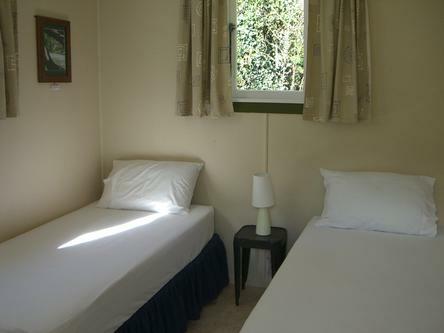 The shared kitchen, toilets, showers and laundry facilities are 20m away. All our cabins have good heating in the rooms. We have 2 cabins of this type. 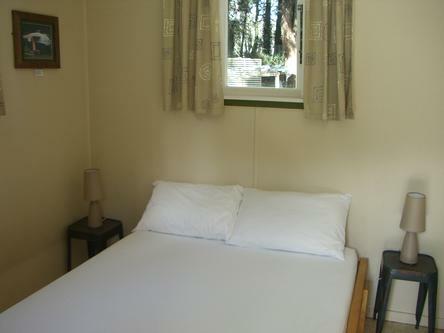 Our four person standard cabins are suitable for up to four guests. 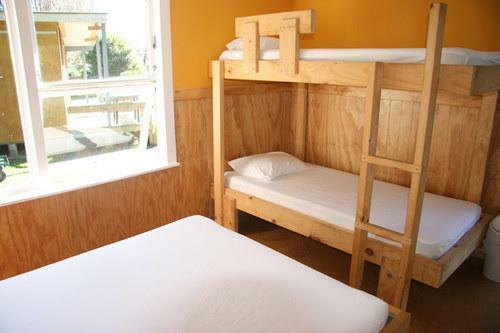 The beds - one double bed with inner-sprung mattress and a set of single bunks - come with bottom sheets, pillows/pillowslips only. Bedding hire is available. Tea and coffee supplies and cutlery and crockery are provided in the cabin. The shared kitchen, toilets, showers and laundry facilities are 20m away. All our cabins have good heating in the rooms. We have 4 cabins of this type. Our twin standard cabins have two single inner-sprung beds for a great night's sleep, ideal for two people travelling together. The beds have bottom sheets, pillows/pillowslips only. Hire of bedding and towels is available. Complimentary tea and coffee supplies are provided along with cutlery and crockery. The shared kitchen, toilets, showers and laundry facilities are 20m away. All our cabins have good heating for winter nights. Our double standard cabin, 'The Love Shack', is ideal for couples travelling together or singles wanting extra bed space. The double bed has a bottom sheet, pillows/pillowslips with bedding and towel hire available. Complimentary tea and coffee supplies are provided in your cabin along with cutlery and crockery. The shared kitchen, toilets, showers and laundry facilities are 20m away. All our cabins have good heating in the rooms. We have 1 cabin of this type. Bedding configuration: Double wooden slat base with inner-sprung mattress. We have a range of spacious, powered sites for caravans and motor-homes and you can choose the site that best suits you! All of our sites are on flat grassy grounds and sheltered by mature trees. 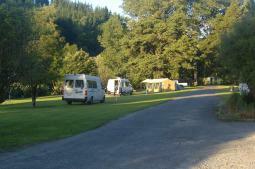 We have a range of spacious, non-powered campsites and you can choose the site that best suits you. 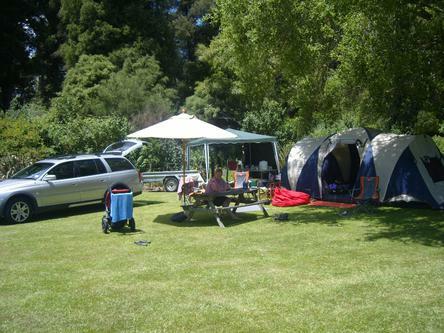 All of our sites are on flat grassy grounds and sheltered amoungst mature trees - perfect for pitching a tent!